So, I have a thing about candy. As in, a love affair. I can’t resist it. I can pass up dessert at any restaurant, even when they whisk the dessert tray in front of my face—I’d rather have homemade. But candy is my kryptonite. It’s a bit comical for those that know me well, because I can be a total health nut, except when it comes to sugar. In my head, eating healthfully leaves room for Dr. Pepper flavored twizzlers. (Yes, you should really buy those). A salad for lunch means I can have a box of lemon heads. (Yes, the whole box). I can justify a trip to World Market like nobody’s business, because, of course, they have a most excellent selection of gummy candy. I love candy. I was at one of my favorite St Louis lunch spots the other day (The Hot Pot), and I noticed several women in exercise clothing ordering little chocolate bars that the server was judiciously pulling out of the freezer. Everything at this restaurant is handmade and local, so I knew these little bars were special. I scoured the menu, but couldn’t find them. Finally, I spotted a sign behind the counter about the size of half an index card that said ‘Paleo Treats.’ One must inquire about such treats. I’m so glad I did. I ordered two, one for me and one for my lunch date. We took one bite, and wanted to turn back around and order a dozen more. They’re genius because the bulk of the candy bar is sliced almonds. Healthy and delicious! And the baker claimed they’re all paleo, made with all natural sugars and honey. I have no idea if my version is paleo-friendly, but I fully welcome the paleo police to stop by and tell me if so! I need to know. Like I need more reasons to stuff my face with these pups. So, yeah, here’s my version of a healthy candy bar. I use the term ‘healthy’ loosely, because there is quite a bit of sugar, though be it in the form of coconut sugar and honey. But the chocolate on top is homemade! I’ve always found the ingredient list in chocolate chips to be a bit sketchy, so I am in LOVE with the idea of homemade chocolate, even if I have to keep it in the fridge to keep it firm. You look like you deserve a candy bar. Yeah, ya do. Line a 9 x 5-inch loaf pan with parchment paper or foil. In a small saucepan, combine the almonds, 1/4 cup honey, coconut sugar and a pinch of salt over medium heat. Stir the almonds until the coconut sugar melts and everything starts to stick together. The almonds should also start smelling fragrant, about 5 minutes. Pour the almonds into the loaf pan, and pack very firmly. Place the pan in the freezer. Wipe out the pan, and return it to the heat to make the topping. To the pan, add the coconut oil, cocoa powder, honey, and another pinch of salt. Heat over medium heat while stirring until smooth. Turn off the heat, and stir in the vanilla. Let the pan of melted chocolate cool to room temperature. (Note: you don't have to do this, but it prevents the chocolate from melting all the way through the bars. If it's cool when it hits the cold nuts, it forms a layer on top). Pour the cooled chocolate over the almonds, and place the pan back in the freezer for about 20 minutes to firm up. Use the parchment paper or foil to lift the bars out of the pan. Cut into 4 bars and serve. These will definitely be on my lunch menu next week! Can’t wait to try. I too can’t pass up candy. Ever. You are a GENIUS! I have a candy problem too. I just love it and lose all self-control when sour gummies are around. But these babies look AMAZING and I’m guessing they wouldn’t leave me crashing and burning like the gummies do. Trying soon! I love the sound of these bars. Any sweets that I can enjoy with a little less guilt are a win in my books! i like the homemade chocolate bit. I could use that for any number of things! Enjoy your candy! 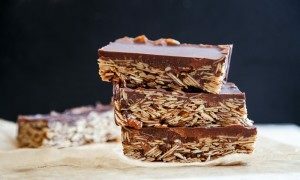 I think I’d like this 1000x better than almost any candy bar on the market-looks sooo tasty and I love read, homemade, foods! Oooh! Thank you so much for validating that I look I need a candy bar! I was just thinking the same thing, but don’t any secret stash left! Normally I crave 80,’s and 90s movie box candy. I love Pop Rop Rocks, Bottle Caps, good N Plenty, and Spree and have that hidden in my drawers and cupboards, not chocolate. But once in a while I just need need chocolate. This invitation of yours couldn’t have come at a better time! Thanks oh crafty one! Of course it is healthy! That chocolate thing is all the buzz these days! And going to be using at half organic ingredients! Gosh, my dyslexia is showing! The reason I rarely post ??? ?dyslexics often skip or repeat words! So sorry. No way! Did you use sliced almonds from the store? Slivered almonds is what the package should say. If you use any other type of almond, I could see them getting hard, but not slivered! Now I’m confused, slivered or sliced? HAH! Sorry. Definitely sliced. Very thinly sliced almonds. Slivered almonds are thick little batons–way too thick for this recipe. Sliced almonds are about the side and width of a fingernail (sorry for that visual!). For the record, these are totally paleo-friendly. Nice! Regardless of dietary compliance, though, these look amazing. I love candy too but the sugar rush/crash gets me every time so I like candy that has more fat in it (like nuts and coconut oil) to kind of balance out the crash! I made these this weekend and they are delicious. The coconut flavor does come thru. The only thing I would change is I would heat up the honey and coconut sugar first and then toss in the almonds. The hardest part was waiting until the bars were cooled enough to eat! OMG, this looks so good! I am a chocolate/dessert lover and it is my weakness. It is so bad, but this candy bar… I could eat this all day and not feel guilty! LOVE that these are guiltless. I have a serious obsession with anything chocolate-related. These would not last very long around here! Love that these are guiltless and I can have more then one piece. Delicious! These look amazing! I’m always looking for new gluten-free snacks and this totally works for me! What a pretty candy bar! I love the slivered almonds throughout. I’m such a huge chocolate fan, I’ll have to try these! 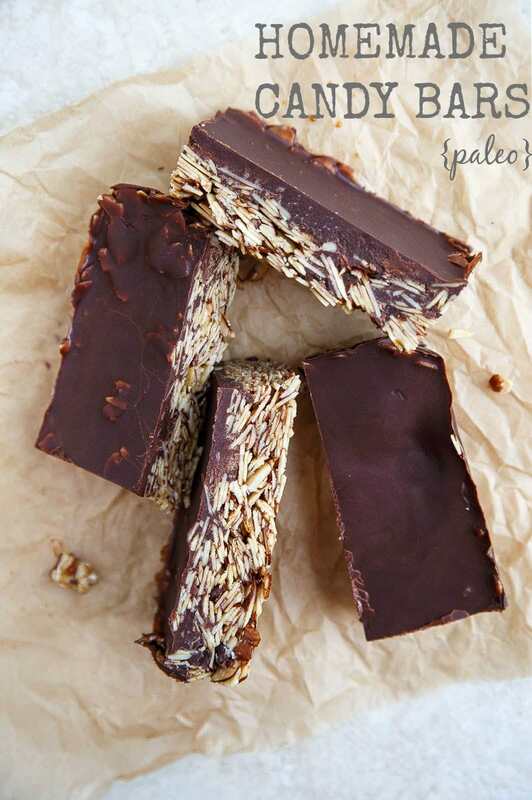 These bars look totally irresistible with that thick layer of your chocolate topping! I’ll need a couple of these for breakfast, please! ♥ ???? love all the almonds in these!! and the chocolate too of course. and since they’re healthy I can eat all of them which is a lovely bonus. Well, guiltless candy bar sure pulled me in. They sound wonderful and I am making them very soon.